Yikes, As Usual! | God is in the details! I have not written the first thing on this blog for 5 days!! May 16: church all day and getting ready for (678) Middle School ministry (it’s the third to the last week until the end of my time as the Middle School Pastor at Restoration Church of God.) So, I was busy all day, didn’t have time to think about my blog. May 17: Kids Club and Mealtime at the apartments (see Square Peg Ministries above.) This day surpasses the busy-ness of the Wednesday ministries the day before. Plus, something was trying to take me over all day, as in sore throat, sickness, etc. Basically had to just drag myself home that night. 4 AM- I woke up and thought my throat had been cut because it hurt so bad- plus I was burning up with a fever. Around 7 AM, I woke up drenched in sweat! Thankfully, my fever had broken. My throat and head weren’t much better- but overall I was relieved to have the fever gone. May 17, 9:30 AM: I felt somewhat better. The good part though was that Amanda brought Lydia over to stay with me while she got a birthday facial and went out for lunch with her friend (and mine! ), Mandi. Lydia and I played with our doggie, Charmin, we threw sticks off the back porch, we had lunch together, we played toys and read books, Lydia took a nap and we watched some fun Playhouse Disney shows. 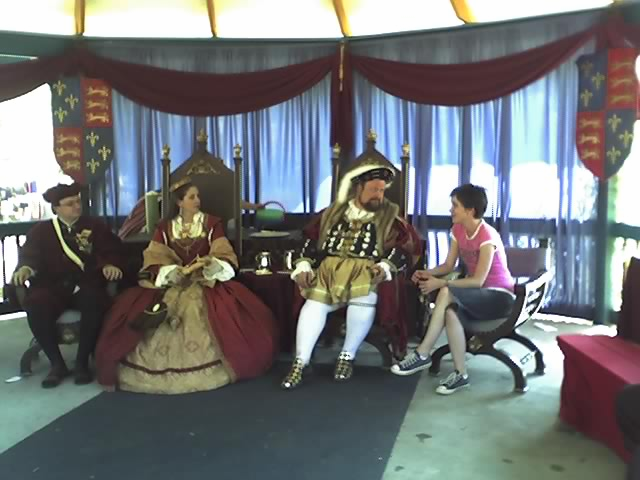 May 19- the whole family went to the Renaissance Festival for Amanda’s 30th birthday celebration. 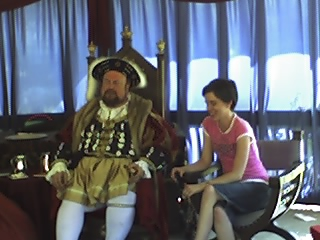 She had an audience with the King and his court! The weather was perfect and we had a really fun day!! Oh Mama! I’m so glad you got a picture of me & the king! I’m anxious to see pics of you in a corset!! hee hee!